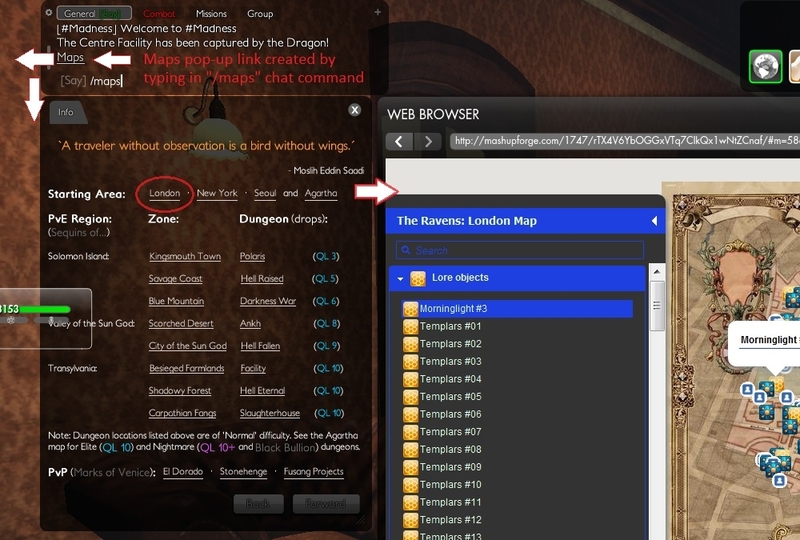 After downloading, just type the command "/maps" (no quotes) in-game. A link will appear in your chat window for this pop-up. Hello, Angels! Download is available top right-hand corner. Everyone else, hello! Group of new players here. Typed up a reference script for my friends and I to better navigate as we journey through TSW. Hope you find it useful as well. There is a wealth of interactive maps out there that contain keys for lore, mission locations, rare boss spawns, and more. Though, I found myself tabbing out of game often since the SW browser does not have a favorites option. Fortunately, a friend of mine had found a script, with links from one of those sites, to use for bookmarks. 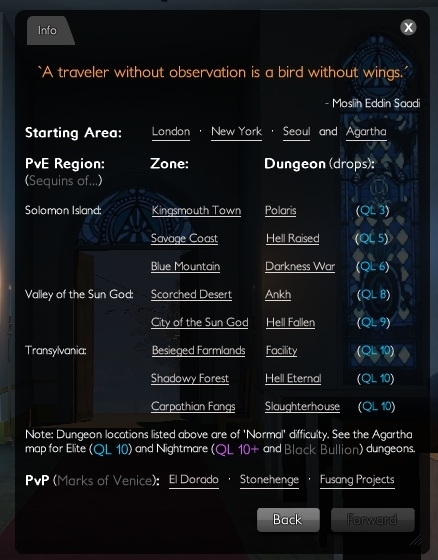 Unfamiliar with many of the names listed, I needed a script that showed me which maps were zones, which maps were dungeons, and how the two were related - a sense of direction and purpose. The "Dawning of an Endless Night" takes us through more than one zone; the Kingsmouth map helped me find everything to explore before moving onto the Savage Coast for that long storyline. 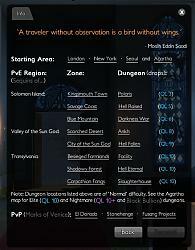 Also, there's a column that shows what kind of QL drops each dungeon provides. Without "levels", I had wondered which LFM calls applied to my current state of experience. The links inside this script are from (and special thanks to, considering the tremendous amount of work these website authors have put in): The Ravens cabal (who skillfully used Mashupforge.com), Dulfy (for their Agartha map for beginners), sw.Nekrosystems.com (contained a complete list of dungeons), and the Lannister Group (had the most detailed maps for pvp areas in terms of factional start and respawn locations). 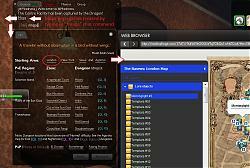 A quick note on Lannister, for some reason, my in-game browser only retrieves a black empty area for their PvP maps. I took a screenshot from my out-of-game browser, slapped on a few notes with MS paint and threw those three images in photobucket. So, those three maps are not interactive but are accurate. Special thanks to Jannik1 from The Secret World forums. He created the original links to the Raven's maps which my friend had passed along. For those advanced players who are more familiar with the categorizations in my script (and no need for my new player gooblygook), his script is gentler to the eye and can be found here. My main character is (changed name since to Spiderbaby), on the Arcadia server. Look me up and say hello anytime. I love sharing scripts and ideas for a better game experience.